Many people think that renovating the bedroom is a costly project, one that will eat up thousands of dollars. But creating extra space or an illusion can be a cheap trick, and we have some in our sleeves. An easy solution for the blank wall in your small bedroom is a DIY artwork. Show your creative side with a hanging graphic quilt. The artwork is cheap solution, it masks the blank wall and adds character to the bedroom. Small bedrooms suffer most from lack of character which makes them look smaller than they are. When it comes to prints, they are great way to create optical illusions in small rooms. A powerful print is appealing to the eye and draws attention to it. However, a smart idea is to keep prints on accessories and accent pieces such as lampshades, pillows and similar objects. Do not go for a huge print. The walls are excellent source for space in the bedroom. Do not ignore them. 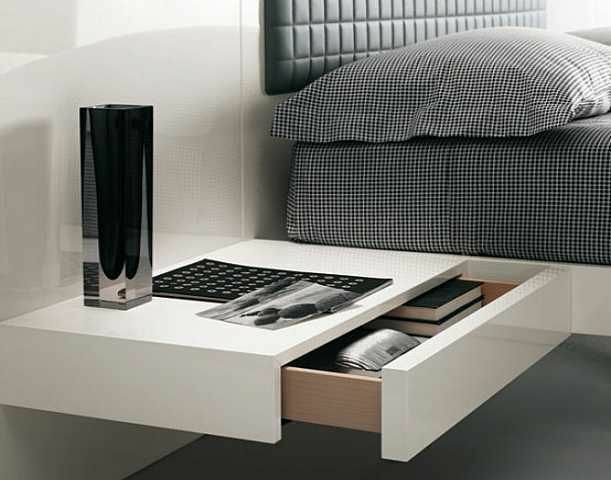 One example is to use the walls to place floating nightstands next to the bed or adjustable lamps. Both ideas will save you room, as they are not place on the floor. Instead, the lamp and the nightstand is placed on the wall. In small bedrooms, you must stick to one theme, one color or one motive. Try to stay as consistent as possible with color and lines. For example, the colors of the headboard should be echoed by the decorations on your wall. If you want to create a flow in the bedroom, stick to one color, but use different shades and tones of it. Mounting a lamp on the wall eliminates the need for a nightstand. In the same time, you get an extra light source close to the bed if you want to read books at night. You can equip the lamp with a multi-watt bulb and tune the light according to your needs. Small bedrooms are usually painted in light shades, such as white, cream and light brown. While the light shades make the room look visually bigger, they look boring in the same time. The solution is to add pops of color on some of the accessories in the room. But be careful, don’t go over your head with colors and be careful not to choose vibrant and vivid colors. They will ruin the effect of your light shades. Small bedrooms have little room for accessories, especially on the floor. However, every room could use a rug on the floor. In a small bedroom, yellow rug will provide a burst of sunshine and add style to your probably white bedroom. As you use the wall, you will notice that you can install more floating furniture pieces, not just a nightstand. For example, the desks and the dressers in your bedroom can also float. It just depends on what you need. You can turn your old drawers and other cast off objects into stackable shelves. The storage savvy solution can be your headboard. Start by positioning all the objects on the floor, and then fuss, fudge and fit until you create the perfect headboard. You can use fillers or you can leave openings for the wall to peek through. The corner in the bedroom, the spot where two falls connect to each other is often left unused. Considered by many a dead space, you can use it to make shelves, nightstand and much more. The shelves can store some of your books or little objects.